Here is a ZENIT translation of the address Pope Francis gave today to the Members of Saint Peter’s Circle. Dear Members of Saint Peter’s Circle! I greet you all affectionately and I thank your General President, Duke Leopold Torlonia, for his kind words. I express to each one of you my appreciation for what you do every day at the service of the weakest bands of the population of our city. Your Association, inserted in the ecclesial reality of the Diocese of Rome, is an expression of an “outgoing” Church: a Church that journeys to seek, visit, meet, hear, share and stay with the poorest persons. Each one of you is asked, not simply to go to encounter the neediest, but to go taking Jesus. It is the going of disciples, of friends of the Lord; it is about sharing His Word, that of the Gospel, of repeating His gestures of forgiveness, of love, of gift, of not seeking one’s own prestige, but the good of others. You have before you the example of Our Lady, to whom we pray with particular devotion in this month of May. Like her, do not tire of “leaving,” of going in haste to meet and take God’s visit (cf. Luke 1:39). She carries God’s visit because she is in profound communion with Him. “Blessed is she who has believed” (Luke 1:45), Elizabeth says to her. Mary is the icon of faith. Only in faith is Jesus brought and not oneself. In this Holy Year of Mercy, while we make an effort to follow the way of the works of mercy, we are called to be renewed in the faith. To take the Lord’s visit to all those suffering in body and in spirit we must cultivate faith, that faith that is born from listening to the Word of God and seeks profound communion with Jesus. I encourage you to continue in your witness of the Gospel of charity, to be increasingly a sign and instrument of God’s tenderness to every person, especially the most fragile and discarded. 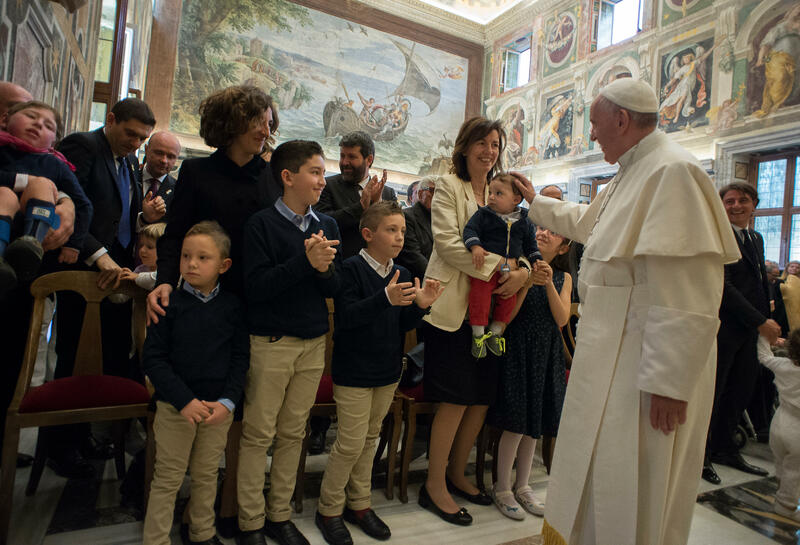 I thank you also for Saint Peter’s Pence, which you collect in all the churches as a sign of your participation in the solicitude of the Bishop of Rome for the poverty of this city. May your meritorious charitable activity be sustained by prayer, to draw from Christ’s heart the love to give to brothers. I entrust you, your families and your apostolic commitment to the protection of the Holy Virgin, Salus Populi Romani, and to the intercession of Saint Peter and Saint Paul. I ask you to sustain my ministry above all with prayer and I bless you from my heart.